A Bunbury man is fighting for workers compensation after claiming he was struck by lightning while working for mining contractor NRW Holdings. Matthew Kahn said he was working as a traffic controller during a storm on the $500 million Mid West Rail venture in WA when he was struck by lightning. He told The West Australian the incident left him temporarily blinded, paralysed him, and left him shaking uncontrollably for two days. “It was pelting down and lightning was going off and all of a sudden I got thrown up in the air and then flat on my back,” he said. According to The West Australian a medical report said he had “neuropsychological sequelae from being very close to a lightning strike”. The Mid-West Rail project is a joint venture between Brookfield Multiplex Engineering, NRW, and Laing O’Rourke. 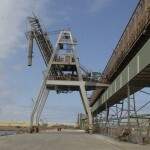 The development is designed to link mining projects in the mid-west and Yilgarn regions to the WA coast. NRW secretary Kim Hyman told The West Australian the company denied forcing workers to work through extreme weather. “You can take it as gospel, no one takes any chances with the weather,” he said. Worksafe said it had contacted Kahn and was investigating the issue.